It’s no secret that I love being an aunt to four beautiful nieces and one handsome nephew. Their ages range from almost 4 years to 19 years, providing diverse conversations, activities and memories. I find contentment with the love and laughter these amazing kids bring to my life. From the moment my oldest niece was born, my heart has been full. With the birth of each child, my heart has expanded to welcome another. Why do I love them so? Really the question is how could I not? The true answer is that I really can’t explain. I just do. Of course my sisters and I are incredibly close so it might make sense that we would be close to each others’ children. Yet, I think it’s these particular kids that tug on my heart. Not just one, but all touch me in their own unique way. Their smiles make me smile. They make me work harder at setting positive examples of hard work and determination in life. Their hugs brighten my day. I never hesitate to have a conversation with one or all, whether discussing high school friendships, the trick to playing Mario Kart, or the antics of the 3-year old at the zoo with her grandma. There’s no real secret to being a good aunt. Be in the moment when together, and enjoy and appreciate the time together. Here are a few tips and things I keep in mind and value about being an aunt. 1. Learn to be goofy and let your guard down. I have always been the more reserved, quiet and shy one in my family. Everyone knows it and accepts it. Yet there is something about hanging out with my nieces and nephew that knocks my guard down. No one lets me be myself quite like these kids. Perhaps it’s because they aren’t old enough to judge harshly or perhaps because they instantly join in the melee and goofiness. I can sing at the top of my lungs, lead a dance party, laugh until I snort, be the only adult playing Wii Dance Party or make up the wildest stories that leave them laughing and asking for more. They don’t judge when I can’t run fast because of my titanium femur. They’re protective of each other – and me. As much as I encourage them to be themselves, they do the same for me in their own special way. 2. Have sleepovers. I wish we had more time to host more sleepovers because these are fun. Truly. Exhausting also (especially when you don’t have kids and host three at once!). But it’s such a special and fun time to have pizza, play games, watch movies and then snuggle in the morning. 3. Believe in magic. Read, build forts, have conversations with stuffed animals, give voice to Barbie dolls and Lego toys. 4. Know the boundaries. I love my nieces and nephew like they were my own children, and I would do anything to protect them and make them feel loved. I’d raise them if, God forbid, we had to. But I’m not their mom, and always respect their parents’ rules and wishes (ok, I may have given them chocolate after 8pm during a sleepover but I was the one dealing with a 3-year old awake at 11pm!). 5. Take a hike (explore the world with them). My sisters and I spent so much of childhood outdoors, which I believe is so critical for children. One of my favorite recent memories with my oldest two nieces was the morning we spent geocaching. I loved watching them be hesitant at first, then grow excited to search and log the next and next cache. 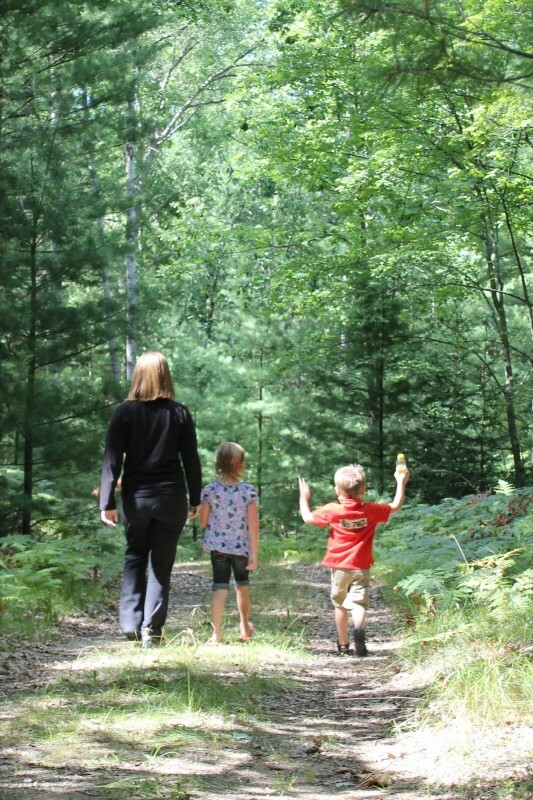 Last summer, the three younger kids and I went on a hike at a local nature center. 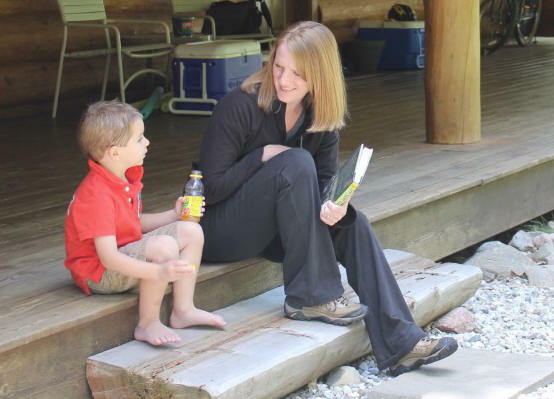 These moments encourage love and appreciation of the outdoors, plus provide wonderful lasting memories for the kids (and aunt!). And you don’t have to wander into the woods to enjoy the outdoors. Walk along a river, wander through a park, check out a farmers market or festival. 6. Read a book. I love reading, especially fiction where I can escape into a new world and adventure. I love reading to children, using fun voices for characters and drama. I must do a decent job as storyteller because I usually get a stack of books when it’s reading time! 7. Give hugs. Often and for no reason at all. 8. Leave technology in your purse, the car or at the door. There is way too much focus on social media, video games and more. People are losing the ability to connect, have conversations and build relationships. The only video game I allow when I’m hanging with the kids is Wii Dance Party because we’re moving. 9. Take pictures. I know I wrote above to leave technology behind, but I’m not talking about texting and posting pics to Facebook while with the kids. Taking pictures is important at times as it lets you capture memories of times spent together. I treasure pictures from my childhood, particularly of those family members no longer here, such as my dad and grandparents. 10. Listen well. Sit down and focus on them, especially individually whenever you can. Let them talk – about school, friends, the latest video trend, their soccer goal, whatever. You’ll learn so much if you simply listen. Let them trust you to keep their secrets and, while you may smile at their child innocence or teenage naivety about the world, never laugh. Build their trust and you will forever be a person they will turn to in times of trouble, joy and question.